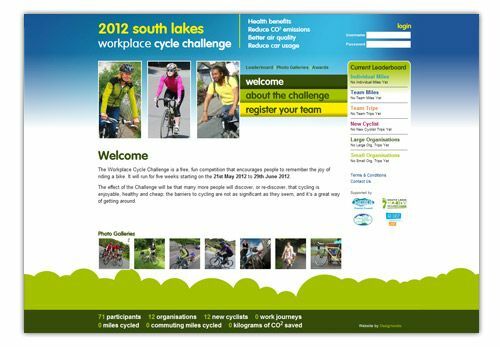 The South Lakes Cycle Challenge starts on May 21st. The aim is to get as many people as possible to ride a bike at some point during the six weeks of the Challenge period. Teams of up to five people representing organisations (or department within organisations) will compete against others for ten different awards, giving any organisation or department a good chance of winning. Last years 228 cyclists and 51 teams took part in the challenge and racked up an impressive 51,997 miles. We developed the website from feedback after last year’s challenge. Participants have more control over their login and miles recorded. New awards have also been added to the site including the individual who registers the most amount of mileage. The live data feed keeps all cyclists up-to-date with leader boards, miles cycled and CO2 saved.